Well, after about a week after hearing what I actually sounded like (via the USB mic) I have cut my practice speed by about 10%. So far I’m liking the result. The tone has improved a good bit, and I’m closer to reaching Norman Blake’s right hand goal of “shaking water off your hand”. It’s a whole arm motion, similar to throwing a baseball, with little wrist effort involved. On another note, Mike has pictures from the Millions More March. I just recorded the old warhorse “Whiskey Before Breakfast” with myself on the lead and rhythm. On the whole I’m liking the new mic. It seems to do a fine job. I need to educate myself a bit on the whole recording process, but I do like it. 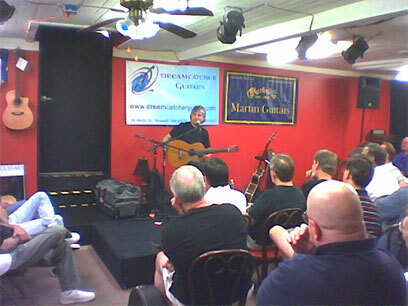 The Lawrence Juber workshop at Dreamcatcher was interesting. There’s no denying that he’s an incredibly talented and innovative player, as well as a master of different tunings. He seemed to be playing a bit too much for the guitar nerd (which is his market) and it wound up being something of an acoustic Satriani, which is good, but not to my taste.